Lamp Socket: G22, highly insulated for hot restrike. Safety Glass Beaker: Borosilicate tempered. Yoke: Aluminum casting black high temperature finish. Large T-handle and large brake area for use with Lightbanks, Speed Rings, Louvers and Lanterns. BEAMER Reflector: 7″ diameter specular parabolic, aluminum 90 percent reflectance electrolytically coated. Mounting/Grip Equipment: All standard 5/8″ baby hardware. 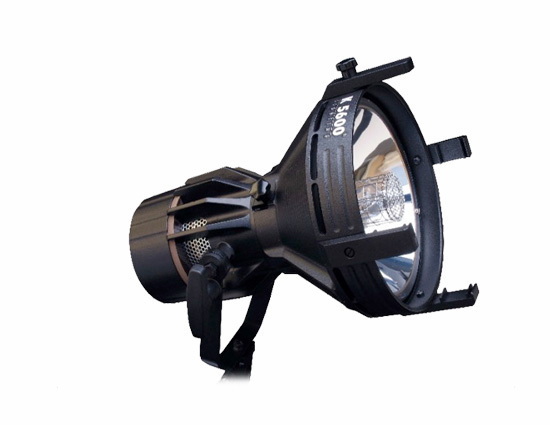 Lamp: 800 Watt MSR/SE daylight single ended discharge. Special UV-Stop envelope. 600 hours maximum life. Power Supply: Electronic, square wave flicker free. AC input: 90V to 132V or by sliding selector switch: 180-265V, 50 or 60Hz. On/Off push button switch. Completely silent (convection cooled).